We’re starting with HOT smoked salmon, not the cold smoked cured salmon you see at the store (also, delicious). This will have a much more tender texture, while still carrying all of the smoky, salmon-y goodness we all enjoy! The potatoes are also a big part of this recipe. 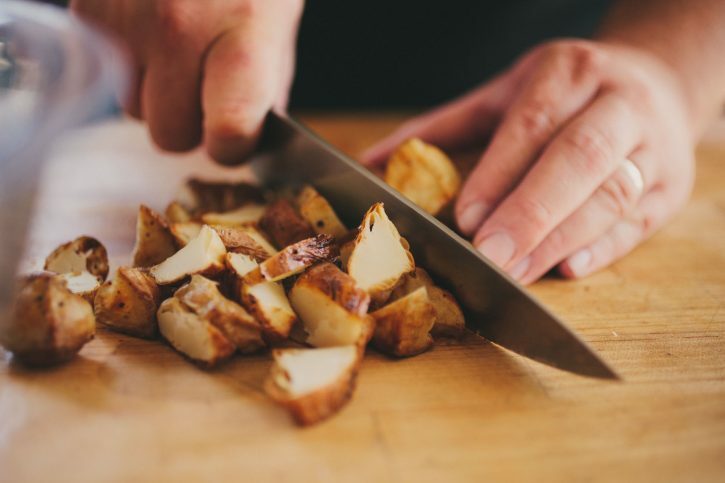 Now, you could just boil the potatoes, and mash them into the mixture, but you’d be missing out on the opportunity to add the texture and caramelized flavors created when you roast the potatoes, instead. 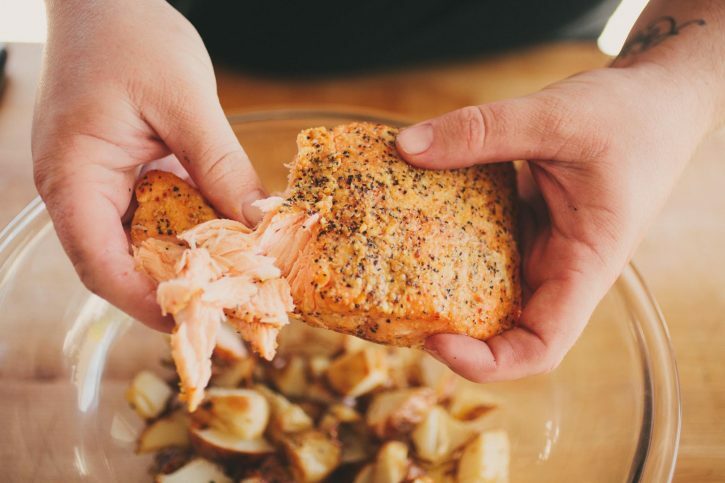 Perfectly cooked salmon (135ºF-140ºF) will be juicy, tender and flake apart perfectly, every single time! A few seasoning agents and binders, and that’s all it takes! Patty ’em up, and finish with a sear! To make the Poblano Creme Fraiche, combine the heavy cream and buttermilk in a plastic bottle or mason jar. Shake well for 10 seconds. Let sit at room temperature overnight. The next day the mixture will be thickened. Place the creme fraiche in a bowl. Add the minced poblano, garlic and lemon juice. Season with salt and pepper. Mix well. 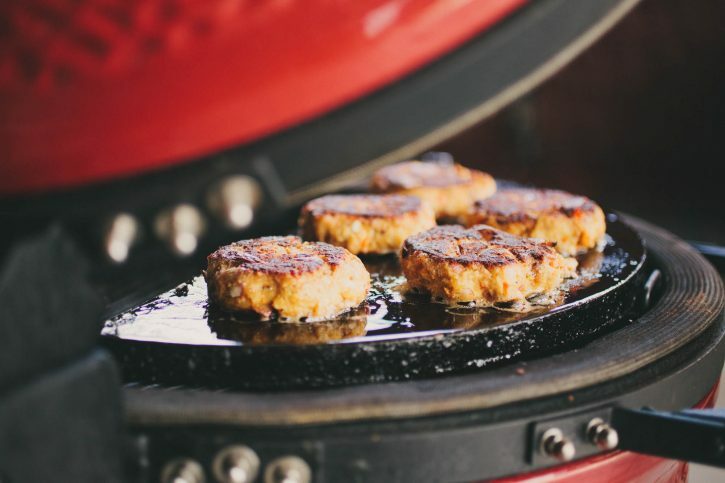 Preheat your Kamado Joe Classic II to 225ºF, set up for smoking/indirect grilling. 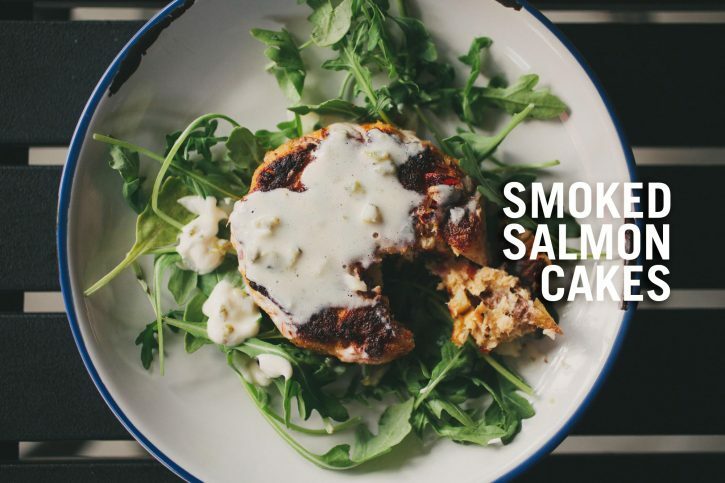 Rub one tablespoon of House of Q Slow Smoke Gold Mustard Sauce over the flesh of the salmon. Season with lemon pepper and Cattleman’s Grill California Tri-tip Seasoning. 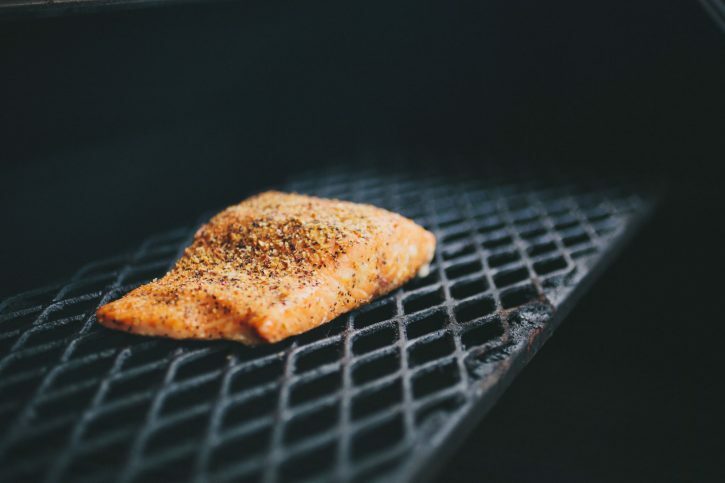 Smoke the salmon directly on the second shelf of the cooker until the internal temperature reaches 140ºF. Remove from the grill and cool. Break up the flesh of the salmon and discard the skin. Remove the deflector plates and place a Kamado Joe Half Moon Soapstone in the cooker to preheat. Open up the airflow to increase the temperature to 425ºF. Quarter the red potatoes. Toss in a small amount of olive oil and season with Cattleman’s Grill California Tri-tip Seasoning. Roast the potatoes in a Lodge 12” Cast Iron Skillet until tender. Remove from the grill. 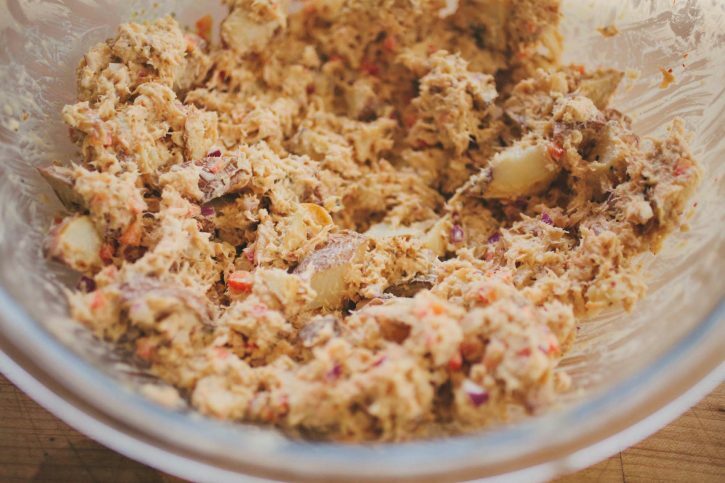 In a large bowl, combine the salmon, potatoes, panko, mayo, red bell, onion, egg and remaining two tablespoons of House of Q Slow Smoke Gold Mustard Sauce and kosher salt. Mash together by hand and form into 6 patties. Place a small amount of oil on the surface of the soapstone. Toast the salmon cakes on both sides until nicely browned. 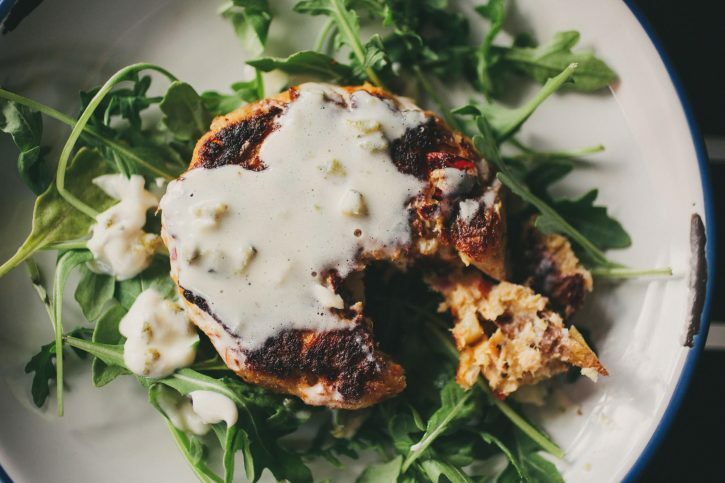 Remove from the grill and serve with the poblano creme fraiche.